Metal roofing is becoming very popular because it adds durability, beauty, and helps reduce the energy costs of your home. This type of roofing is available in a wide array of colors, textures, and styles, and can suit anyone’s aesthetic preferences. Have Bruce Andrews Seamless Gutters install your Standing Seam Metal roofing to add efficiency and style to your home while saving money at the same time. Bruce Andrews Seamless Gutters understands what homeowners are in need of when it comes to updating, replacing, and above all saving time and money on exterior renovations such as installing a new Standing Seam roof. Longevity Metal roofs can last 40 to 70 years, depending on the material. Traditional asphalt roofing materials have an estimated life expectancy of roughly 12 to 20 years. Durability Some metal roofs can sustain wind gusts up to 140 miles per hour, will not corrode or crack, and may be impact-resistant (depending on which metal you choose). In addition, metal roofs don’t need the periodic costly maintenance that other roofing materials often require. However, they should be inspected periodically to make sure no repairs are required. Safety Metal roofs will not spark and ignite into flames during a wildfire or lightning strike. Energy efficiency Metal roofs reflect solar radiant heat, which can reduce cooling costs by 10% to 25%. Surprisingly, properly installed metal roofing is no noisier than any other type of roof. 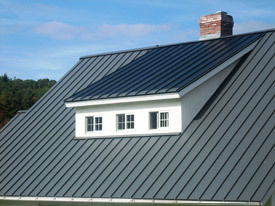 Metal roofing is typically installed over a solid substrate. Additionally, the attic and insulation provide a sound barrier. 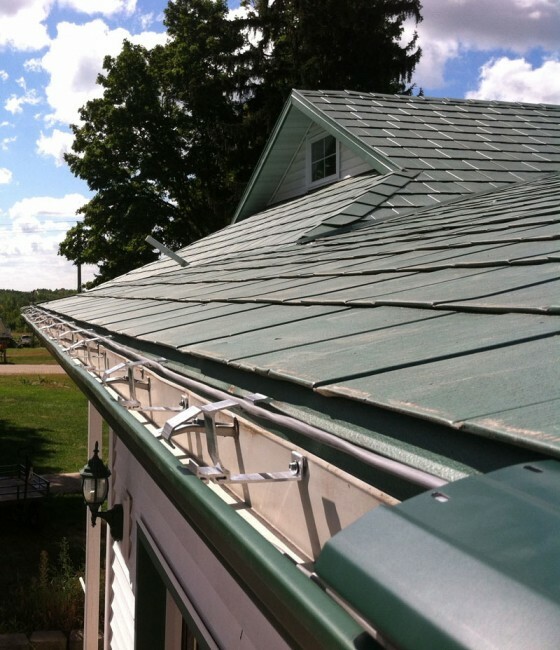 If you wish to have Bruce Andrews Seamless Gutters, LLC install Standing Seam metal roofing over your existing roof, the metal roof will most likely be raised over the existing roof by means of furring strips. These furring strips will create an air pocket which will further deaden sound. Standing Seam Metal Roofing in various western Wisconsin cities, Ellsworth WI, River Falls WI, Hudson WI, St. Croix County WI, Pepin WI, Hager City WI, Prescott WI, Bay City WI, North Hudson WI, Eau Claire WI , Durand WI, Alma WI, Nelson WI, Lacrosse WI , Benefits and advantages of installing a new Metal Roof on your home is important to Bruce Andrews Seamless Gutters,LLC. 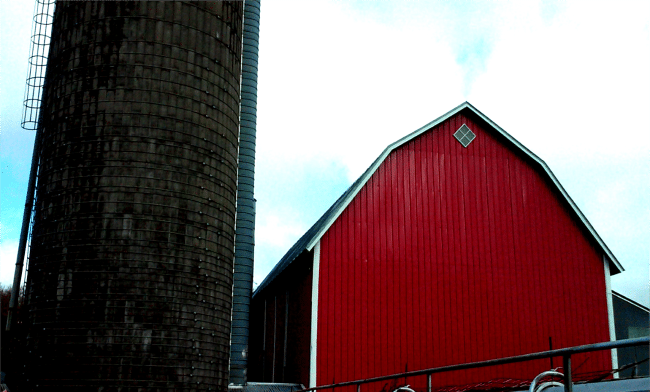 This property Located in Somerset WI was a total barn repair and replacement of Standing Seam Metal Roofing and Siding. 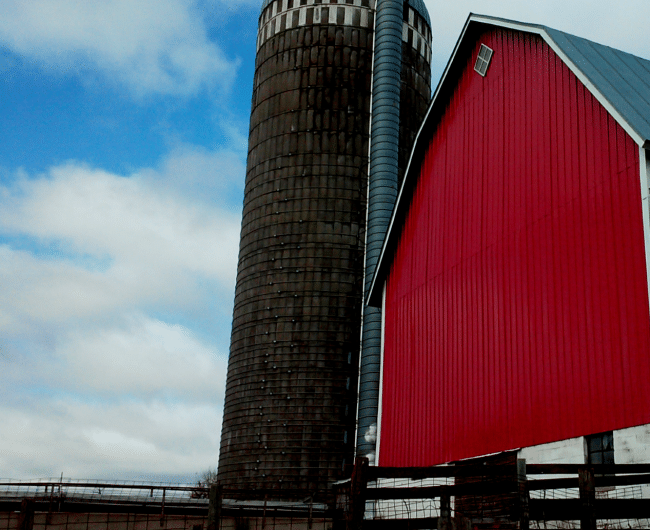 The Team of Bruce Andrews Seamless Gutters spent many hours recreating the Barn Siding and Roofing to match the customers needs. The Standing Seam concealed fastener panel gives you the leak resistance and beauty of a traditional standing seam roof without the expense and installation difficulty of clips. 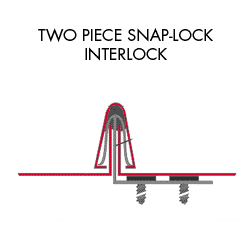 The fastening slots allow the panel to easily expand and contract with temperature changes. 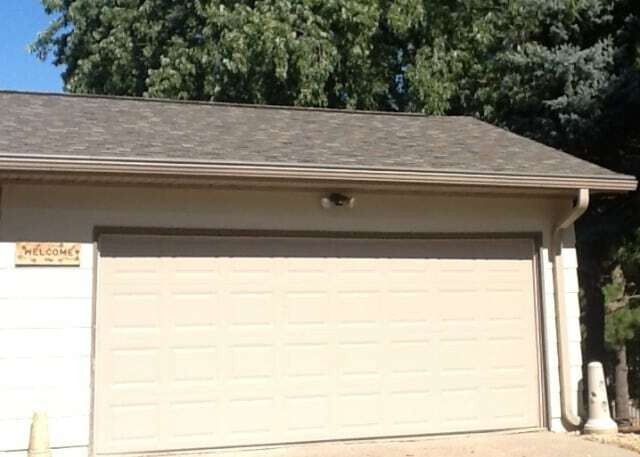 The 1” high rib provides a sharp, well-defined look for residential and light commercial applications. Standing Seam Metal Roofing . 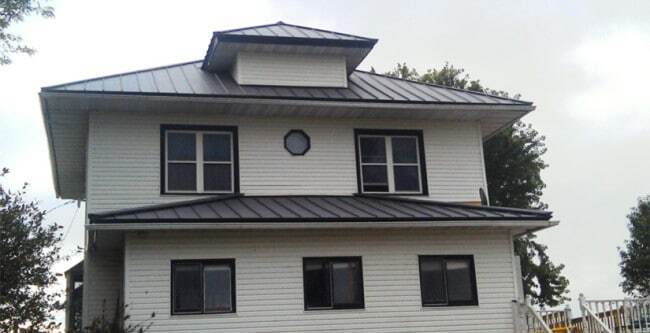 Residential Metal Roofing offers a look that can complement many home styles. With clean lines and complimentary trim your neighbors will be impressed. While you enjoy many years of maintenance free living under your Hixwood metal roof. 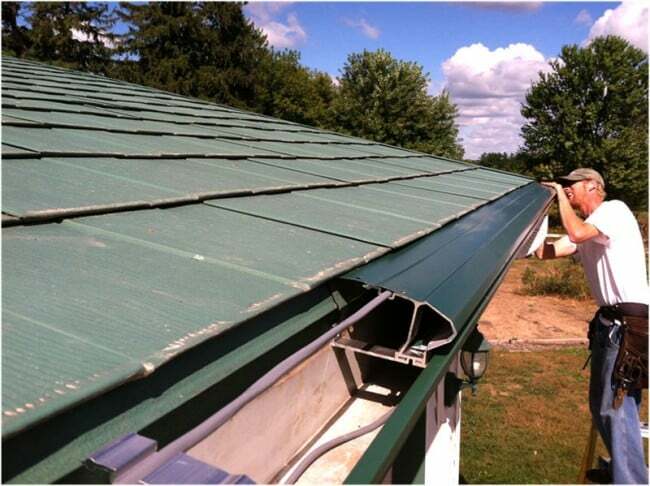 The team of Bruce Andrews Seamless Gutters has enjoyed working with many homeowners to create a new roofing system using Standing Seam Metal from Hixwood Metal in Stanley WI. Metal, most often Galvalume steel, is consistently chosen as the roof material for projects with roof slopes of 1/2:12 or greater. 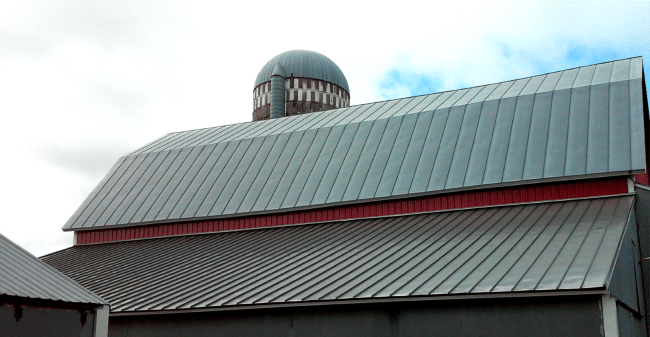 There are several forms and styles of metal roofing; the most common are the vertical standing seam roof design. Standing Seam Metal Roof Panel Systems have proven to be an extremely effective and long lasting material choice when installed properly. When it comes to improving the curb appeal to your home, there are a number of options to choose from. 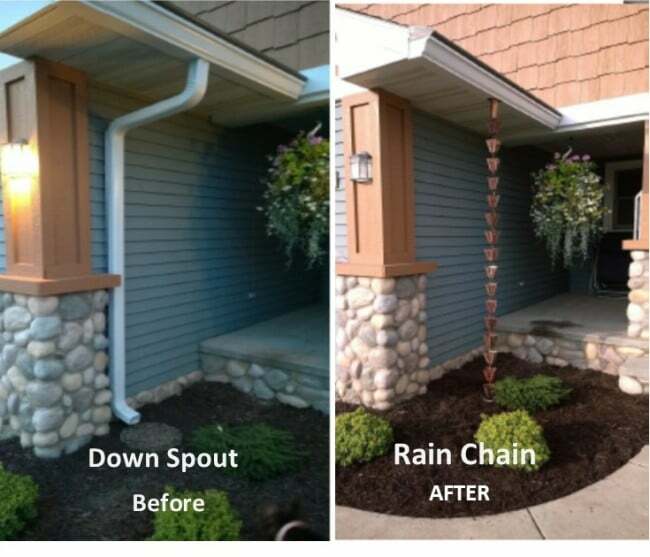 This customer chose to improve the front of her home aesthetically by eliminating bulky down spouts and having us add in Rain Chains. 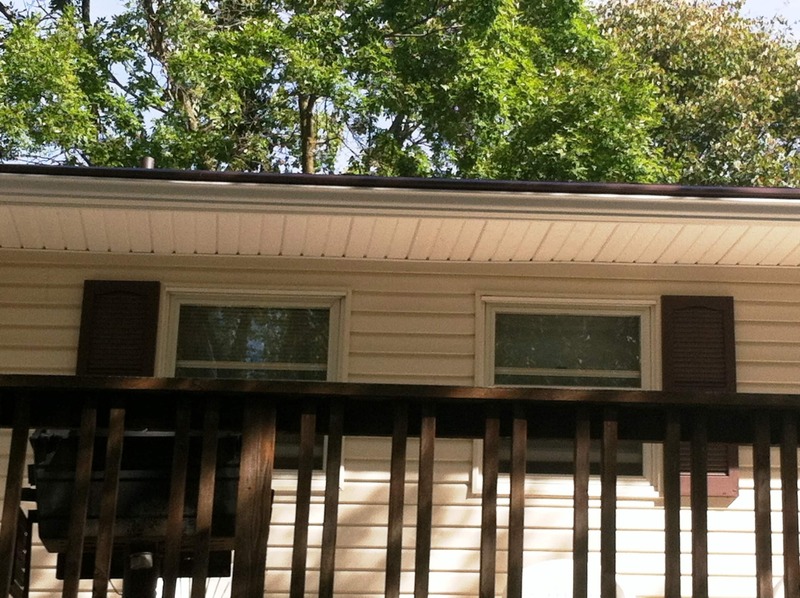 As you can see in the Before and After pictures on this home, The team of Bruce Andrews Seamless Gutters spent time planning an effective yet charming look to this customers home. 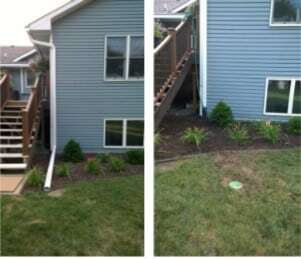 These pictures show the difference between having downspouts and underground drain tile with pop-ups. Having us change this has really improved the look of her landscaping perimeter around the house, not having the downspout extensions lay over the shrubs really makes a difference. Bruce Andrews Seamless Gutters takes pride working with homeowners and finding the best solution for the exterior functions of their homes. Looking to update the exterior finishing of your house? Look no further, Bruce Andrews Seamless Gutters, LLC can help you find the perfect solution to your homes curb appeal.